The article is fourth in the series from Wande special issue on Kashmiri women titled Me and Militarization. While recently researching the history of human rights violations in Kashmir, I was looking for information on the crackdowns that were a frequent phenomenon in Kashmir in the early 1990s, which have now returned after over a decade and are known as CASO’s (Cordon and Search Operations). I came across a few photographs by Kashmiri photojournalist, Habib Naqash. One of them (used above) caught my attention more than the others. Because while looking at it, I felt like I was experiencing a déjà vu. At that time, I tried hard to remember but could not attach the feeling to any particular event in my life. And recently while preparing to go to bed at night, a splash of memory came hitting me like a big mighty wave. Suddenly I realised that the déjà vu was actually a memory from my childhood which my brain had chosen to hide away from me. I realised that I have lived the experience captured in that photograph. This photograph worked as a chasm for me through which I could re-enter that part of my being which was hidden. When the memory unfolded, I could recollect all the details about the very event, incidentally nothing before or after that. 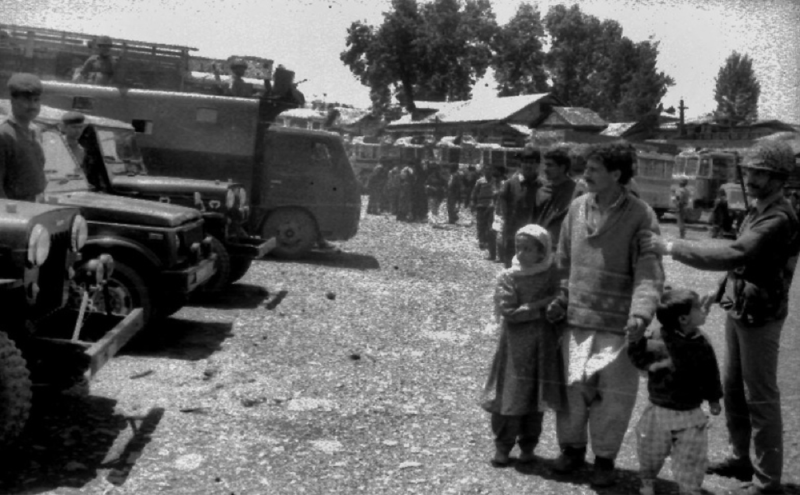 I was returning home with daddy in a public bus when all the vehicles were stopped near Nowgam on the outskirts of Srinagar, by the Indian military. All the passengers were made to de-board. A crackdown was announced. All the people were made to sit on one side of the road. Holding my daddy’s hand, I was sitting in the front row; there were at least 4 or 5 rows of people who had been assembled there. It must have been 100-150 people; all passengers from the vehicles plying on the road. People were called one by one, made to stand in front of the military vehicles (this was a usual practice to identify militants and their supporters by informers who would be sitting masked in the army/police vehicle), parked on the other side of the road and then moved forward making way for another person. I remember feeling terrified but nothing about the incident was unfamiliar, except that it was the first time I was paraded. Maybe the novel part of it for my father was also that it was the first time his child was paraded along with him. After the parade, everybody was allowed to leave; at least I don’t remember that anyone was detained. Or again my brain is hiding something. While recalling this incident all the memories of crackdowns I have witnessed as a child came back to surface. When there were door to door searches; local, mostly middle-aged men were made to enter the houses first and the Indian armed forces would follow them. I also remembered that as a child I would think that they are doing this so that people cannot accuse them of loot in case there is loot. I did not understand the concept of a human shield back then. I remembered a time when there was a crackdown which continued for three days; morning till evening. Not only my village but the whole area, around ten villages were put under a severe crackdown. All the men were made to assemble in a government school premises, at least two or three kilometres from our village. I remembered when during a search inside our house, which was an old structure; the military personnel used long thick rods to bang on the walls. When they banged on the wall of the store (space under the stairs with a door), it sounded hollow, the forces questioning about it, and me getting frightened that they might dig it, which was not uncommon during crackdowns. I recalled the presence of three military camps, one of which still exists, on three routes that I could take from the bus stop to my home, while on my way back from school. I remember the cat-calling which me and my friend were put through during those returns from school. Now I could understand why my brain chose to forget these experiences. My childhood would not have been able to bear the constant misery. We humans have very strong mechanisms for survival installed in us, a gift from nature. Forgetting about traumatic experiences is one survival instinct. Our brain tends to put away traumatic, negative or scarring memories and we cannot remember them consciously. Though present there, our brain hides them from us, to protect us. This makes the documentation of our experiences as we are living them, all the more important. The whole incident, from the experience itself to the photograph to the recollection of the memory, made me realize the importance of recording the history we are living. It also made me realize the importance of memories and recollection in a place like Kashmir. Not a single chance is lost by our oppressor to distort our history, presenting incomplete or completely made-up historical facts to us. We are not even taught our history in schools, as if we didn’t exist.